On Thursday, October 25, O’Neal 7th-12th graders gathered during morning meeting to hear a truly one of a kind presentation about the Holocaust. Mrs. Rose Mills, a friend of O’Neal parent and trustee Lynda Acker, came to speak to O’Neal student and faculty about her parents’ firsthand experience surviving the Holocaust in Germany. Mrs. Mills, who is now retired, was a medical writer and worked in the pharmaceutical industry. Currently, she is a member of the Holocaust Speakers Bureau, located in Chapel Hill. 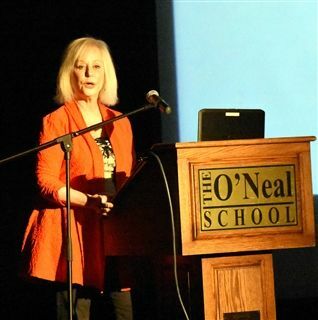 In her presentation to students and faculty, she shared her parents’ stories of survival and journey through the Holocaust from the early moments of discrimination against Jews in Germany, to her father’s 3+ years spent hiding in a tool shed to avoid Nazi persecution and finally to her parents’ reconnection in the US after 7 years apart during the war. Her combination of historical information and personal stories from her parents captivated the audience. Towards the end of the presentation, Mrs. Mills shared a story of visiting the Holocaust museum years ago with her husband and turning the corner to find her father’s Germany identification card from the Nazi’s in the lower corner of a display. The eighth graders in attendance at the presentation are visiting the display on their 8th grade class trip to Washington, DC.